Make your bathroom sparkle and shine like never before with the only cleaning brushes featuring a four-finger-hole cushioned grip. 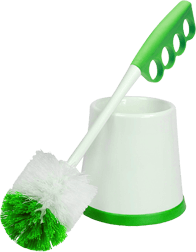 These brushes offer maximum comfort, support and scrubbing power for the toughest bathroom cleaning jobs. From toilet stains to black rings inside the toilet bowl to dirt and mildew build up, cleaning your bathroom has never been easier.